Move More with a Vacuum lifter. Many manufacturing and distribution centers don’t consider vacuum lifters as a viable solution to repetitive moving in their facilities. For Acculift, this is a problem we hope to address, as vacuum lifters are incredibly versatile end effectors (sometimes called the “below the hook” device) that can move a variety of materials of considerable weight. Combined with a G-Force and rotate-tilt mechanisms they can provide accurate and very precise handling abilities – perfect for getting that glass or sheet metal EXACTLY where it is needed. Yes, there are vacuum lifters specifically built for flat surfaces such as sheet metal and glass, and that is what most people traditionally think of when they hear the term “vacuum lifter”, but in fact, there are end effectors built specifically for handling non-flat loads. With a foam end effector, you can move luggage, dog food bags, feed bags, cartons, cardboard boxes, corrugated steel and more. Lifting bags is a basic part of many agricultural production processes and vacuum technology is the way to do it safely. Vacuum bag lifters are used to lift and place bags onto pallets or bins (many food manufacturers split and empty the bags into the processing containers this way). Manual lifting of bags is often a hazard due to the awkward grip or height of the lift required and through the sheer repetition of movement of the bag handlers. Most bag materials are airtight so that standard suction feet can be used to lift and move the bags. With porous materials, such as feed bags, a rubber skirt is attached to the suction foot to compensate for the air leakage. That all depends on what you consider “light”. Is 300 lbs light? 600lbs? 3000lbs? Vacuum lifters can be designed for any load and can securely lift full sheets of metal, large heavy glass windows, loose bags of seeds, heavy luggage, and lots more. The suction volume of the lifter dictates the weight it can grab, which can be substantial, but it is the crane and hoist system that ultimately dictate maximum loads. The vacuum lifter is only part of the lifting solution – the part that “grabs” the load. The operator positions it where it needs to go and in this aspect, you have a lot of choices with the swivel points of your lifter dictating maneuverability. With many swivel points built into the lifting mechanism, the load can be placed exactly where you need it to be and with complete control the whole time. Lifting mechanisms can tilt and rotate the load and with the multi-speed control you can handle heavy, delicate objects, precisely. In this video, we demonstrate a vacuum lifter with tilt and rotate capabilities. This system also has variable speed control, and when combined with the Gorbel G-Force intelligent lifting system, you will see how truly versatile vacuum lifters can be and how they can fit into your production line at your organization. Contact us for a demo. There are two types of vacuum lifters, continuous lift, and vacuum lifters. The continuous lift provides constant vacuum pressure for material handling where the load and vacuum may lose suction – such as canvas bags or objects that warp when lifted. A constant vacuum pressure system ensures that the load is lifted, and maintained in the lift, safely. Specific vacuum pads are required for this type of lift that have a larger lip that maintains suction. Most lifts; however, will use standard vacuum lifting mechanisms that “lock on” to the load and don’t require constant vacuum pressure. 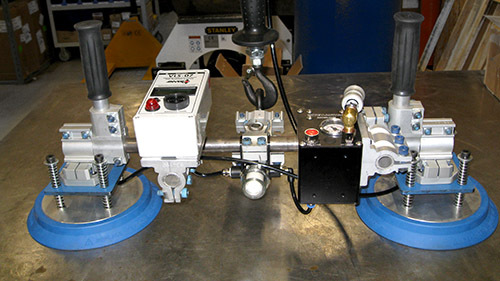 These systems have gauges and alerts to maintain the vacuum pressure for safe lifts. What you are lifting and moving will dictate the type of pad (end effector) you will have installed and will dictate the type of lifter you will use. Here are some of the types of pads available and their applications with many more varieties for even more varied load control. Machined lip to insure the seal stays in position.